What exactly makes millennial employees different from their older colleagues? We know that it’s something. Research reports, with titles like “Millennials at work: Reshaping the workplace” and “How Millennials Could Upend Wall Street and Corporate America,” commonly portray them more like an invading army than a generation maturing into adulthood. Businesses are terrified of not being prepared to engage, retain, or even communicate with millennial workers. The mystique isn’t unwarranted, but it may be exaggerated. It’s true that millennials are different than their older peers in some ways. Millennial views on privacy and communication, for example, are rooted more in Web 2.0 than in traditional social norms. They are digital natives and acutely socially aware. But on many issues, millennials are actually pretty similar to Gen Xers and their parents, the baby boomers. They differ from older generations in primarily one way: the desire, not the fear, of career mobility. There were differences reported between the two generations, but they seemed to reflect the natural contrast between young people and old people. For example, 67% more millennials than boomers said that having a mentor is important at work. Well, that makes sense; boomers made the transition from mentees to mentors decades ago. Millennials also “value self-expression up to eight times more” than baby boomers…as measured by engagement with social media. Again, of course millennials are more active on Instagram and Facebook than their parents. But boomers have their own well-documented need for self-expression. Marketers have long known that baby boomers consider self-expression extremely important to their generational identity, along with ideas like ‘individuality’ and ‘reinvention.’ Both generations crave self-expression in era-appropriate ways. The lone characteristic of millennials that they don’t seem to share with their parents or with Gen Xers is the need for job mobility. Overwhelming evidence suggests that millennials tend to prefer short-term employment over long-term stability. “Job hopping” is the term. For this, there’s really no corollary in any other modern generation. Millennials took note of this economic shift away from a stable workforce and decided to use it to their advantage. The result is that today, at a time in which millennials are newly the largest generation in the American workforce, the average tenure of a job is just 4.6 years, “down sharply” from the 1970s, according to Fast Company. An employee’s job tenure has always been correlated to age, but what’s new with millennials is a craving for career change that’s so intense, it veers close to an outright aversion to stability. According to Gillian B. White in the Atlantic, 53% of “older” survey respondents find it desirable to spend one’s career with a single employer. Nearly the same proportion of millennials prefer the exact opposite: frequent job changes. Not just from one company to another, but often between completely different industries. Maybe the desire for a peripatetic career is why millennials consider workplace learning so important. “This generation is committed to their personal learning and development,” reports PWC, “and this remains their first choice benefit from employers.” As such, offering a good learning environment is the fastest way to millennial hearts. Training and development is 50% more popular than cash and three times as popular as a 401(k) or pension among millennials. 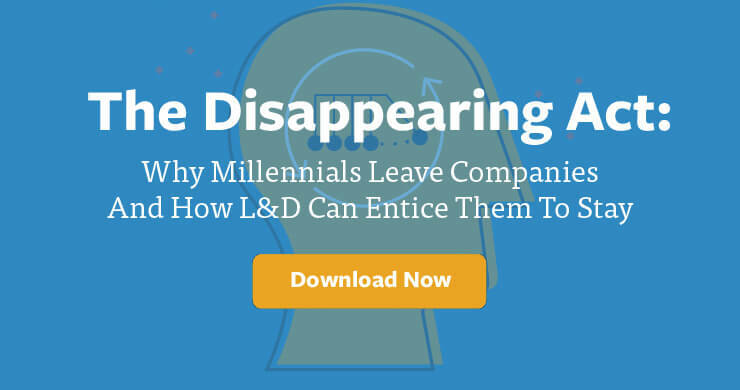 L&D is consistently reported as one of the top three benefits millennials consider when choosing to stay at a job. Millennials will eventually grow up and have families, of course. Though they’ll continue to transform the workplace technologically, over time they’ll likely grow statistically similar to their baby boomer parents in terms of lifestyle choices. But it’s exactly that knowledge—a determinism, maybe, or even an attempt to confront it—that founds the millennial desire for adventure when they can get it.